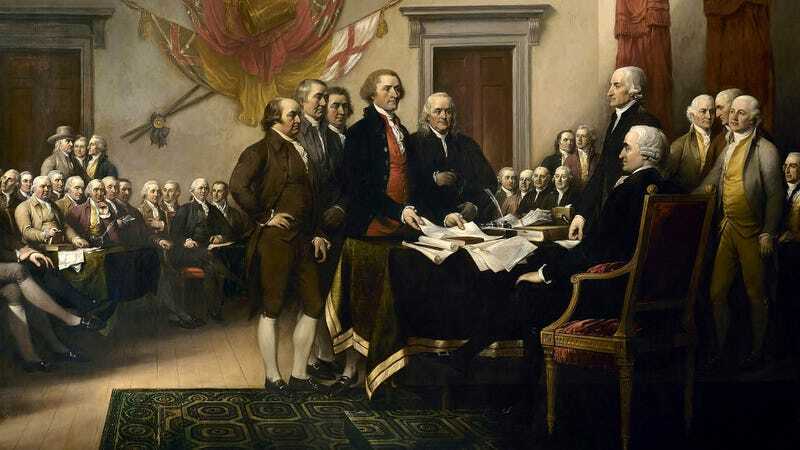 WEST LONG BRANCH, NJ—Shedding new light on the U.S. populace’s view of current national predicaments, a Monmouth University poll released Tuesday revealed that an increasing number of voters hold the founding fathers responsible for starting America. “As many as 75 percent of voters blame the country’s issues on the leaders of the American Revolution for bringing the United States into existence, representing a 20 percent increase from a survey conducted last year,” said lead researcher Harriet Zipperman, noting that a majority of the electorate feels that matters ranging from presidential overreach, illegal immigration, wealth disparity, and governmental dysfunction can be traced directly to individuals including George Washington, Thomas Jefferson, and James Madison for drafting the Declaration of Independence and ratifying the Constitution, which 62 percent of voters now view as a mistake. “Our data reveal that three out of four voting-age Americans would characterize the framers’ process of revolting from Britain and forming their own system of governance as ‘completely bone-headed’ and ‘lacking in even the smallest amount of foresight,’ and we only expect that number to grow as our politics become more and more contentious.” Zipperman added that the survey also revealed 55 percent of voters found fault with Abraham Lincoln for fighting to preserve the union.